Archery Country is the Midwest’s premiere archery proshops located in Waite Park/St. Cloud, MN, Rogers, MN and Brainerd, MN. They pride themselves on their extensive knowledge and depth of products they carry in a true pro shop setting. Archery Country provides professional services for bows, archery accessories, and everything archery or hunting related. Archery Country is proud to bring you the largest selection of bows in the Midwest. With hundreds of bows in stock at all times of the year at each store, they are sure to have what you’re looking for. No more driving from store to store to try out bow models. Shoot them all and know that you’re not getting steered in the wrong direction. They are a full line dealer of Mathews, Mission, Bowtech, Diamond, Quest, Prime, Hoyt, Elite, PSE, Strothers, Bear, Martin, Obsession, and Expedition. 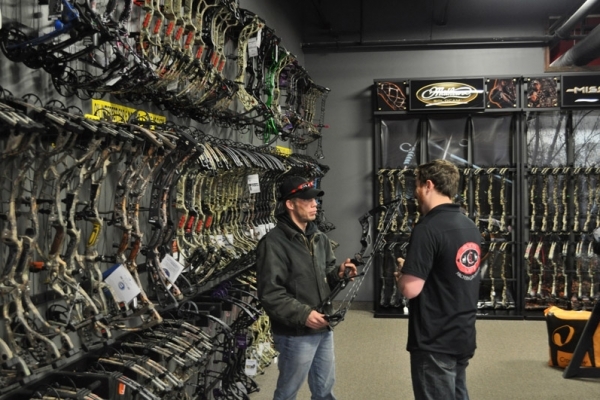 They also carry a full line of crossbows including Mission, Excalibur, Velocity, Killer Instinct, Tenpoint, PSE, Stryker, Parker, Horton, and Barnett. Archery Country also carries a number of other products; treestands, camo clothing, archery manufacture clothing, archery accessories, rangefinders, knives, targets, trail cameras, food plot seed, deer minerals, and much, much more! Archery Country provides a full line of pro shop services from bow setup to tuning. Being a dealer of all brands there are no bows or crossbows that Archery Country is not experienced in setting up or servicing. If you are buying a bow or just getting one worked on, rest assured that the Archery Country staff are some of the best trained bowtechs around. Bow setup, warranty work, tuning, restring, etc. Crossbow setup, warranty work, restring, etc.